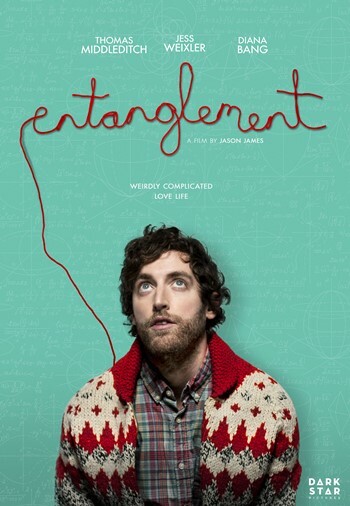 Starring Thomas Middleditch, Jess Weixler, Diana Bang, Randal Edwards, Marilyn Norry, Eric Keenleyside, Johannah Newmarch, Jena Skodje, Shauna Johannesen, Nicole LaPlaca, Mackenzie Gray, Graeme Duffy, Viv Leacock, Denalda Williams, BJ Harrison and Angelo Renai. Distributed by Dark Star Pictures. 85 minutes. Not Rated. You don’t often expect a light romantic comedy to begin with the lead character attempting suicide. Granted, these attempts are played for light-hearted laughs – this guy is such a loser he can’t even kill himself right – but it’s still an oddball concept. This mixture of the serious and the frivolous turns out to be a tightrope act that screenwriter Jason Filiatrault and director Jason James negotiate through the entire film – not always successfully – in this basically likable but somewhat inscrutable Canadian rom com. The failed suicides (or are they just a cry for help?) are attempted by Ben Layten, a recently divorced man who is still mourning his recent divorce. Ben is played by the perfectly-cast hangdog comic actor Thomas Middleditch (from HBO’s Silicon Valley and the ubiquitous series of Verizon commercials). Six months after the failed suicides, Ben is still trying to make sense of his life and depression, but doing it in a half-cocked way, as he does everything else. His psychiatrist specializes in child psychology and lets him know straight out that his problems are probably out of her expertise. He has also created a CSI-type murder board on his apartment wall trying to track all the major milestones in his life, hoping to figure out where everything went wrong, go back and change course. Since he doesn’t sweat the details, he didn’t even notice that he made the board with permanent marker. Tabby, the girl next door, has a crush on him, though he hasn’t really noticed it. Honestly, she seems a bit too good to be true – she breaks into his apartment to clean up for him, she loans him money regularly, and she is always there for his needy phases. In the meantime, after his father had a heart attack, he moves back in with Ben’s mother with whom he has been estranged for years. While talking to the two of them, it comes out that they had just adopted a little girl when mom became pregnant with him but had to give her back because she was having her own baby. Ben becomes obsessed by this little girl who may have been his sister and decides he must find her to see if she is the answer to his problems. But while he is looking for her, by chance he meets a gorgeous, wild, exciting girl named Hanna (Jess Weixler, who was so good a decade ago in Teeth). They meet cute at a local pharmacy. He notices her shoplifting and doesn’t turn her in, and then she starts talking to him right as he is getting a slightly embarrassing prescription filled. She comes on strong and essentially picks him up. They become friends, and then it gets more serious. She is addicted to risky things, and it makes the naturally cautious Ben loosen up. However, there are a bunch of red flags, too: she steals his wallet for fun (she gives it back), she breaks into his house (and doesn’t even clean up), she talks him into breaking and entering at a local pool. It turns out that she may have been the girl his parents had to give up all those years ago. It seems like a whole lot of coincidences, but it turns out maybe they weren’t coincidences after all. Entanglement has some interesting things to say about coincidences and fate, reality and fantasy, life and death. However, it is done in a mostly lightweight, good-time rom-com vibe until the major swerve nearly gives the audience whiplash. The movie is juggling a lot of styles, ideas and moods, and in the long run it is unable to keep all its balls in the air. Still, it is an interesting near miss. Copyright ©2018 PopEntertainment.com. All rights reserved. Posted: February 9, 2018. Tags: Angelo Renai, BJ Harrison, Denalda Williams, depression, Diana Bang, Entanglement, Eric Keenleyside, Graeme Duffy, Jason Filiatrault, Jason James, Jay S. Jacobs, Jena Skodje, Jess Weixler, Johannah Newmarch, Mackenzie Gray, Marilyn Norry, movie review, Nicole LaPlaca, PopEntertainment.com, Psychology, Randal Edwards, Shauna Johannesen, Silicon Valley, Teeth, Thomas Middleditch, Verizon, Viv Leacock. Bookmark the permalink.